I work with businesses to help them improve safety, so I’m well aware that carbon monoxide is a hazard in many workplaces. But this time of year—vacation season—I can’t help but also think of the dangers of carbon monoxide to people who most definitely aren’t at work. Carbon monoxide doesn’t care if you’re having fun or not—it’ll kill you if you don’t respect it. In particular, I worry about people in camping tents and ice-fishing shanties, which are both designed to keep out as much of the outside weather as possible. The better they do that, the easier it is for carbon monoxide to build up if you’re releasing it inside. A lack of awareness about carbon monoxide’s dangers is evident in the findings of recent online poll of 2,000 people who camped at festivals during the past six months. Almost half(49%) of the respondents said that they would use a barbecue inside their tent! I’m not at all trying to scare anyone away from camping or fishing, or any other recreational activity in which carbon monoxide is a danger. It’s not hard to prevent buildup of this hazardous gas as long as you respect the danger. 1. Use carbon monoxide detectors. There are many types of carbon monoxide detectors (including portable models) that can warn you when carbon monoxide levels are getting too high. They’re the insurance you need in case you make a mistake. 2. Be extremely cautious about bringing fuel- burning devices into enclosed spaces. In frigid or wet weather, it may be tempting to grill inside a tent or ice-fishing hut, but the fuels used to produce heat for cooking also produce carbon monoxide when burned. Keep the grill outside always. Some portable heaters can be safe in enclosed spaces, but only if all precautions are taken as directed by the manufacturer. If you’re not sure it’s safe, don’t risk it—better to cover up with some extra blankets! 3. Know the symptoms of carbon monoxide poisoning. Early symptoms include headaches, dizziness, fatigue, nausea, reddish skin, confusion, and increased blood pressure. In many ways, the symptoms mimic those of the flu—or even of too much food and celebration. Don’t make assumptions if you, or someone around you, begins to have these symptoms in an enclosed space where fuel is being burned. Usually, if carbon monoxide symptoms are detected early and the exposure to the high level of carbon monoxide ends, the symptoms subside on their own. However, if the carbon monoxide is allowed to build to acute levels, death can occur rapidly. This is nothing to play around with. 4. Don’t overestimate the power of a little ventilation. Ventilation is critically important, and whenever burning carbon-based fuels it should be a top concern. However, leaving the tent flap open while you’re grilling inside may not be enough ventilation. It’s not a risk I’d take. There needs to be good ventilation, not just a little. The Checker is all about increasing safety through better inspections, so I saved this point for last—but it’s certainly not least! A carbon monoxide detector does you no good if it’s not working, and it can actually cause harm if it gives you a false sense of security. A heater that’s normally safe inside a tent with proper precautions can be very unsafe if it’s leaking gas. Whenever planning a trip where you’re going to be exposed to carbon monoxide, make a list of all the items that involve its use and inspect them to make sure they’re functioning properly. When you’re getting away from it all, have a great time! But don’t have so much fun that you forget about the perils of carbon monoxide. It’s not difficult to protect yourself, but one slipup can turn a vacation into a tragedy. Image courtesy of Per, Creative Commons. We recently blogged about the National Safety Council’s efforts in the U.S. to get people to “take safety home” when they leave the workplace. But it’s summertime, and a lot of people are enjoying themselves away from home. It’s easy to get so excited about a vacation that you don’t think much about safety. 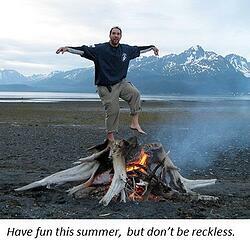 Unfortunately, safety hazards don’t take vacations. If you’re careless while having your summer fun, the fun can abruptly become a nightmare. The Checker helps businesses improve safety through better inspection processes, and inspections are also a key part of preparing for a safe vacation. Here are seven tips for being as safe as possible this summer, four of which involve inspections. 1. Do a complete inspection of your vehicle before leaving on vacation. Check the brakes, fluid levels, lights, tires, spare tire, etc. before you hit the road. Not only can vehicle problems screw up a vacation, they can cause potentially tragic crashes. 3. Don’t get so relaxed that you forget to follow the basic common-sense rules for safe driving: Drive defensively, don’t drive too fast, don’t drink and drive, don’t text or send emails while driving, and don’t drive if you’re too sleepy. 4. If you’re doing any outdoor grilling, be sure to inspect the propane tank before firing up the grill. You want to cook food, not yourself! 5. Don’t grill in enclosed spaces such as garages; the carbon monoxide buildup can be deadly. 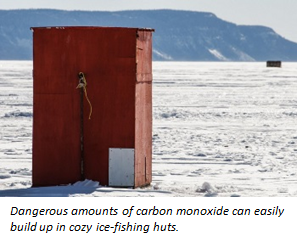 This carbon monoxide danger also applies to heaters in tightly sealed spaces (e.g., camping tents, ice fishing huts). 6. Be safe on the water. You don’t have to be racing boats or water skiing to get hurt on the water. Obviously, inspect the boat before taking it on the water to make sure it’s water-safe and running well. Wear life vests, always supervise children, don’t drink and operate a boat, pay attention to the weather, be aware of your surroundings and other boats on the water, etc. It’s a good idea to take boater education classes if you’re not an experienced boater. 7. Pay attention to what you’re doing. Many injuries that happen on vacation are rather mundane—straining your back with heavy luggage, taking a misstep while taking a photo or filming a video, staying in the heat too long and suffering a heat stroke, forgetting to put on sun screen and getting a severe sun burn, etc. In many cases, when such injuries happen it’s because people have gotten so caught up in the fun they’re having, that they forget to look out for their own safety. You’re on vacation, but that doesn’t make you invincible! Vacations should be a worry-free, no-stress time, but you can’t afford to stop thinking about safety—even when you’re having the time of your life. Image courtesy of Matthew Baron, Creative Commons.